[ENDED] Closers HQ: Closers NA CBT Access Code Giveaway Part 2! THIS GIVEAWAY HAS ENDED AND THE WINNERS HAVE BEEN ANNOUNCED ON THE DISCORD! Please keep an eye out for when Giveaway Part 3 comes! Alright people, we will now begin the second giveaway of Closers NA CBT Codes! *These are just buddy codes and not founder packs, so all these will do is to give you access to CBT, but no other founder rewards. We will potentially be giving founder packs, but this first one will just be three buddy codes for the CBT access. Thank you guys for the raffle entries in Giveaway Part 1! When I proposed to pick a number from 1~100 expecting ~30 people to sign up for the raffle, more than 80 people signed up for it, and it pains me that I can't give every one of you a giveaway code. However, due to overwhelming number of entries, I picked 5 winners instead of the original 3! For all of you who won the giveaway, DM me to claim your CBT Access code. If you do not DM me within 3 days, then your code will go to someone else! Alright, onto the second part of the giveaway. It will be the same format as the second giveaway, except there's more variety of numbers this time, from 1 to 1111. Don't question it. This time, it will be dedicated to Seha. 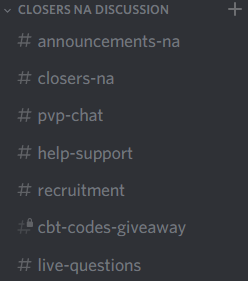 *If you are already in CHQ Discord and have CLS-NA role, skip to #3. 2. Then, assign yourself CLS-NA role by going to #hq-bot-cmd under General Discussion and typing !joinNA. 3. After you assign your CLS-NA role, the hidden channel called #cbt-codes-giveaway should become visible under Closers NA Discussion. 4. In that channel, post any kind of picture for Seha- regardless of screenshot, fanart, official illustration, etc. Do NOT post a NSFW art! 5. Along with the screenshot, simply choose a number between 1~100 that WAS NOT taken by a previous member who have posted in the channel. First come to get the number is first serve! 6. Do NOT post anything else within the channel to reduce clutter. Feel free to have discussions in #closers-na, though. 7. You are done! Winners will be picked on November 8th, around 6 PM PST. But the time can change depending on my mood, so do try to get the raffles in pretty quick! We will also be having continuous giveaways throughout CBT for those who haven't won the giveaway, so watch out for Part 3 or Part 4 giveaways to come. And I ensure you, they will come soon. That is all, Closers. I hope you win this giveaway and contribute to some closing on Closers NA.